Having now maintained our own Interior, Integrated Wood & Oil Heating System since 1975 and more recently integrating Outdoor Wood Boilers to our Weil-McLain FHW Heating Systems, we are motivated to pass on some of our observations. Disclaimer: We are exclusive Weil-McLain Heating Designers & Installers here in NH only (thus far). We do not nor have not specified, sold or initially installed any interior or outdoor “Solid Fuel” (Wood, Pellets, Coal, etc.) Boilers. Our participation has been to occasionally help out a customer integrate these products with our Weil-McLain Hydronic Heating Systems per our personal experience. 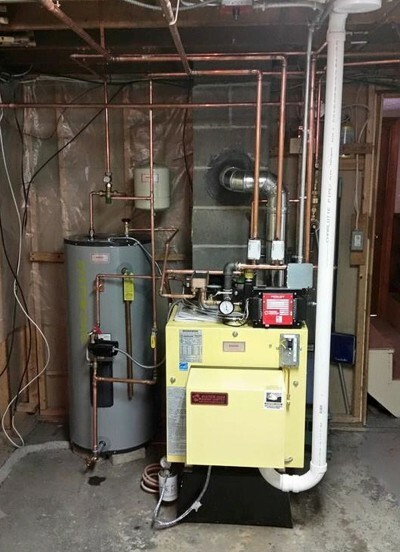 Included has been converting Steam Boiler Systems to FHW and conjoining these systems. Note: We offer as an option full-size fittings (plugged) at our boiler supply and return points to integrate other boilers. Specify at ordering. The recent popularity of Outdoor Wood Boilers in particular has prompted many inquiries and discussions on our part. They seem however to neglect the interior-located solid fuel boiler in the scope of options. Each of these have distinctive attributes that both complement and complicate their integration and operational effectiveness. The Fire Codes usually reference both, but are tough on Interior Boilers. Insurers (risk takers) then determine how much it is going to cost you to save money. Again, interior boilers take the major hit, especially if it is the primary energy source. Note: The delineation is between Gas/Oil-fired Power Burner Heating Systems and Solid-Fuel Fire (Coal/Wood, etc.) Systems. Insurers will usually bend for Automatic Stoker-fed Coal and Automatic Wood Pellet Systems with a two-week continuous-feed fuel storage supply. Check your local codes and insurers, however. Any Interior Wood/Coal Heater REQUIRES A DEDICATED CHIMNEY FLUE! Flue quality must also be considered to support a continuous fuel fire. A “sometimes option” is to convert the primary powered burner (gas/oil) appliance to a “direct vent” device vs. the additional flue construction cost. Check it out. The Outdoor Wood/Coal Boiler has its own integral exhaust stack. However it is not unusual to see vertical stack added, sometimes up to 20 ft. to improve draft or smoke dissipation conditions. An Interior Wood/Coal Boiler can be readily be coupled to a FHW System, given flue location options. Interior Boilers are typically like-pressurized and therefore operationally compatible. An Outdoor Wood/Coal Boiler is typically “Zero Pressure” to simplify construction, ease of operation and complexity. This comes at a price with a continuously-powered, “high head” (flow resistance) system loop to the FHW System using a tough circulator. An in-line Heat Exchanger is required to mate the pair. Significant heat losses occur as well. Interior Wood/Coal Boiler Loop Losses are typically dissipated to the ambient surrounding area and usually indirectly contribute to the heating of the structure. Outdoor Wood/Coal Boiler Interior Loop Losses are as prior, but Exterior Losses are very significant! (We have a system with over 400 feet of high quality, insulated two-pipe, buried down several feet. You can readily observe the reduced/absence-of-snow line path.) You must further isolate the “Zero-Pressure” Outdoor water from the interior “Pressurized” water using a “Plate-To-Plate” Heat Exchanger System with controls & circulators. This system contributes some heat to the ambient area, however. All Interior Boilers dissipate energy between cycles to the ambient and incur flue losses (heat up the chimney). The chassis and piping energy is generally accepted to be contributing to the heating environment positively excepting during the non-heating season. All Outdoor Boilers lose significant energy both from their chassis (never any snow on them) and their exterior service loop if circulation is not inhibited with demand. All this is lost energy by definition. Albeit being an empirical determination, the relative efficiencies of interior vs. outdoor boiler systems will be effectively higher due to their placements (in heat value areas) and reduced loop and standby losses. Thus the terminologies assigned and relationship to each other. Note: We are not addressing the Heat Generation Efficiencies of any boiler products in our discussion, these varying by configuration(s), but only their overall performance by type. Open the NH Climate Audit Calculator (Excel Doc). It’s a useful tool to both qualify and quantify your options by “playing the numbers”. Our “trick” is to calculate the “Cost per Million BTU” for a selected fuel, then adjust other fuel costs to equal your selection MBTU value. Remember to adjust your fuel appliance efficiencies if known or use the defaults. The resultant is a great “apples to apples” economic comparator! Further observations of field operation leads us to believe that many outdoor boiler users fire them virtually continuously, incurring very poor fuel utilization, during low heat demand periods. Perhaps there is a continuing need for DHW (Domestic Hot Water) Generation without a storage means provided, or an unwillingness to build a new fire. We have evidenced outdoor wood systems consuming 11 cords of wood that in our humble opinion should be consuming no more than 5 cords with an interior boiler, 45% of the outdoor unit. Granted this is a very heuristic and unqualified determination, but yet an indicative one. Whatever the case, if one presumes to maximize his fuel utilization the household must adapt to the characteristics of the solid fuel fired system. “Showers-On-Demand” will likely require a generously sized Indirect Water Heater (Super-insulated DHW Storage Tank) to accommodate this lifestyle. Otherwise an incremental or even seasonal fallback to the gas/oil-fired system may be necessitated, and desirable. There is a tendency of auxiliary wood/coal users to “over-engineer” their systems. A prolific use of circulators, relays and controls result. We would respectfully suggest that exploring the use of Taco® Delta-T ECM Circulator Technology would benefit energy management. Further, employing Taco® Zone Sentry Valves with these permit some emergency (no power) gravity heating on interior boiler systems. Outdoor Wood Boilers appeal to users who have larger fuel demands, an abundant, low-cost supply of particularly cord wood, time and resources available to process it! (As we say: “Wood warms you twice!”) Higher equipment installation costs and poorer total fuel efficiency is a definite factor in their consideration. Interior Coal/Wood Boilers are operationally more desirable, but regulatory influences must be qualified and satisfied. Installed Costs of any dual-fuel system are substantial. To minimize this and achieve predictable performance, use of a qualified technical resource is recommended. Utilize a “system guy” and not just a “tech-sketch” provided by the boiler salesman. Not maintaining ideal and consistent heated water delivery in any system takes its toll on equipment, in particular circulators, through very long duty cycling. Operating as a dual fuel system otherwise between 1975-1985 and 1995 to date. We have been using only a modest amount of wood in recent years, restricted by wood fuel costs and time constraints. 3-1/2 Zone, Programmed T-Stats, Coupled FHW Oil and Wood Boilers. DHW Immersion Coil on Oil Boiler. Planned Upgrade: Large Indirect Water Heater (HTP SSU-80) for DHW to permit less low/no heating season boiler cycling. TBD. Dual-fuel and in particular interconnected FHW boiler systems offer a good heating option, given they be properly configured and operated. We have a long ways to go however to inform and guide customers in their economics, application and execution. It is our hope that this document is of some help toward this end. Periodic discussions with Do-It-Yourselfers (DIY’s) prompts us to cover the subject of heating loops (radiation piping) frequently. These are particularly prompted by Steam-to-FHW Boiler Conversion inquiries that inevitably come to “how do I pipe my radiators if I want to use them?” A good time to review distribution piping. The Series Loop – The most common configuration. Piping from one radiation element (baseboard, radiators, fan convectors, etc.) to another in a serial sequence and returning. The Split Loop (sometimes also called the Split Series Loop) – A larger pipe feeds to the middle of a series loop and supplies water to both halves, returning again by individual pipes or to a larger pipe, closing the loop to the boiler. The Monoflo(w) Loop – A larger, closed piping loop that continually flows water. Radiation is teed off this “runway” to both its ends, driven by a Monoflo Tee that pulls (moves) water through them by utilizing the “venturi effect”. Too small a circulator and/or piping size results in a “lazy” zone – temperature (heat) in the first heating element to the last can drop significantly, providing uneven heating. Install too large a circulator to overcome this and you risk “hydronic noise” created by over-speeding water. Take care to not create very long-piped zones as a practice. You inadvertently are loading your electric bill in either case. Longer circulation cycles in a “lazy” one or overpowering in the latter. Size and lay out zones properly. The Split Loop by nature is more efficient, requiring less power to move water and lessens the temperature (heat) differential across radiation significantly. It’s also a good way to get out of trouble with a poorly performing Series Loop – as long as it’s not too poorly configured. Strategically it’s also a good choice for future splitting into individual zones. Plan ahead. In new construction lay out your common feed(s) and return(s) so that you anticipate future lifestyle heating options. In old construction, re-pipe with feeds and returns to enhance current heating conditions while again anticipating future options. The Monoflo Loop is a technique that is currently seldom used due to cost. It takes a little more pipe (and time) to configure and requires a little more circulator to drive the venturi fittings, but if you want nearly simultaneous, even heating – this is it! Which brings us to the major current application for the Monoflo System, converting Steam Radiators to FHW Heating. Re-pipe every steam radiator into a two-pipe supply and return, and drive them with a Monoflo Distribution Loop. This is the only effective way to even out a radiator zone. There’s a lot of water in those radiators! Pipe them into a Series or even a Split Loop and you will appreciate the term “lazy” heating. DIY Steam to FHW System converters make note! The result is well-balanced, even heating with fewer, although more forceful circulator cycling. Know your heating loop options and do your technical homework related to pipe and circulator sizing for efficient distribution. Author’s Note: This discussion is predicated on contemporary fixed (single or multi-select) speed circulators. 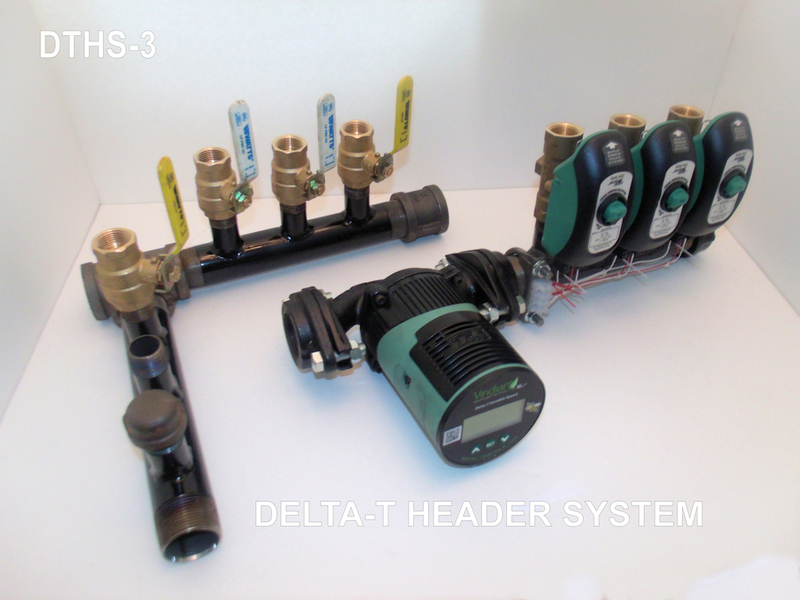 The hydronic distribution “ball game” has now totally changed with the introduction of Delta-T ECM Hydronic Circulation. It is applicable to both new and existing installations, providing dramatic electrical along with fuel consumption reductions. 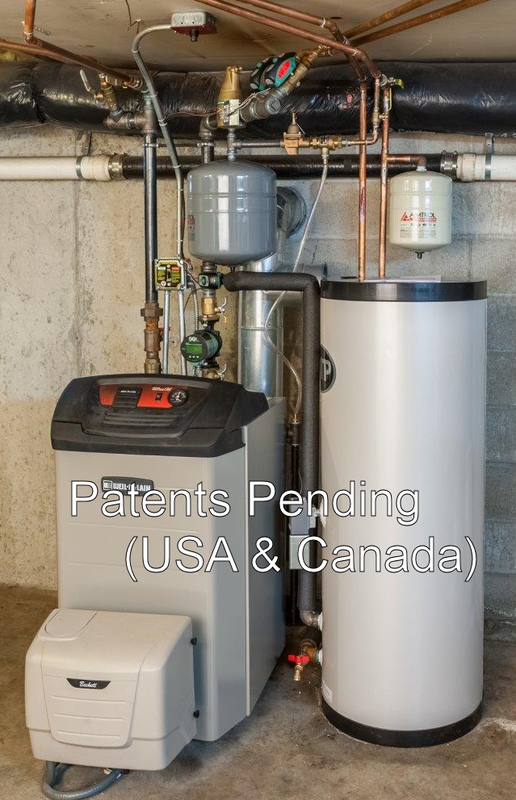 We are acknowledged application pioneers of this technology and have recently filed for Intelligent Property (Patent) Protection in the USA & Canada) on our ENHANCED CONVECTION, DIFFERENTIAL TEMPERATURE MANAGED, HYDRONIC HEATING APPLIANCE.